After wearing it for years, it’s not difficult to notice that your jewelry doesn’t shine anymore. Grime, dirt, and dust build up with time, and this may end up affecting the shiny look of your jewelry. 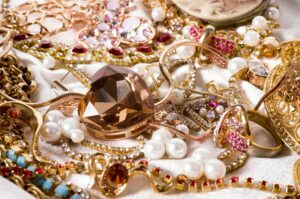 The good news is; you don’t require a professional cleaner to restore your jewelry’s appearance. Here are 6 methods you can use to clean your jewelry at home. A toothbrush with clean, soft bristles is the right tool for fighting dirty jewelry. With a toothbrush, you will be in a position to access the nooks and crannies that are difficult to reach. You can use water to scrub away the light spots but when there is a buildup of dirt, you can dilute toothpaste with water before scrubbing the jewelry. Rinse the jewelry after the entire process and allow it to dry. Hard metal jewelry requires hot water to clean. Heat causes the dirt and debris to loosen, making it easy to wipe away. Boil your jewelry in a heatproof container for some time and then wipe off the dirt from its surface. You need to remember that this technique does not work with opals, pearls, or other gemstones although it is ideal for gold, silver, diamonds, and platinum. Baking soda along with the effervescent tablets results in a chemical reaction when water is added. The fizz and bubbles produced by this reaction can help get rid of the dirt on the surface of your jewelry. Allow the jewelry to soak for a few minutes before wiping it with a clean cloth. This technique is ideal for silver jewelry and diamond ring but not suited for pearls or gemstones. With this simple maintenance technique, you don’t have to worry about owning jewelry. You can visit this website for some of the exceptional jewelry you can own. A multipurpose antibacterial cleaner can be a suitable option for cleaning your jewelry. Pour a small quantity of this cleaner into a glass bowl and allow your jewelry to sit in the liquid for about five minutes. The dirt buildup should start falling off your jewelry. After the five minutes are over, you can take out the jewelry and scrub it using a clean, soft-bristled brush and allow it to dry. Water and soap are an excellent cleaning combination for a reason. Though a simple solution, water, and soap work effectively on stains, spots, and general grime. You can mix a few drops of the liquid soap with water and place the jewelry inside the solution for a few minutes. Remove the jewelry and rub its surface with a clean cloth and allow it to dry. Ammonia work wells when it comes to cleaning diamond. Place your jewelry into a bowl or a jar of ammonia solution (a full cup of water and fourth cup ammonia) and allow it to sit for approximately 15 minutes. After soaking, use a soft-bristled brush to scrub off the dirt. The above are some of the effective jewelry cleaning techniques you can use at home. Utilizing one or more of the processes above will ensure your jewelry retains its shiny look throughout. A first aid kit is one of the most essential items to bring with you on a family road trip. Bandages, painkillers, ice packs, and disinfectants should all be contained within. Besides, a first aid kit is something that should be in your vehicle anyway. And if you’re just in the process of shopping for one, make sure to browse a Forest River RV dealers online to make the comparisons needed before settling on the final choice. RV’s an ideal type of vehicle for any kind of camping trip imaginable. Getting lost in the middle of a forest is the last thing anyone would want to go through. Alas, this is what often tends to happen if you’re exploring new territory for the first time without some form of navigation. With that in mind, don’t forget to download the appropriate map packs from the web before you embark on your adventure. Without keeping your eyes on the road at all times while driving, you’re putting your entire family in danger. At the same time, you may want to answer important business calls or run one of the apps you’ve installed on your smartphone. Well, the good news is that there’s no need to either choose one or the other; simply install a smartphone holder, and you can safely use your smartphone without it being too much of a distraction. And that concludes our list of essential items you should take with you on a family road trip! That being said, these are the bare essentials – don’t forget to bring fun items with you as well. Board games, a hanging net, some books, wine, and plenty of smiles; these are all a great start. But don’t get too fixated on having a perfect trip either. As long as you and your loved ones are having fun, all is fine and well. Garages typically act as the catch-all for storage. However, some garages actually do house cars and workshops, and for these garages having a durable and long-lasting floor surface is crucial. Unfortunately, regular concrete slabs wear-out, cracking and settling over time. Therefore, when it is time to resurface your garage floor, you owe it to yourself to weigh all your options. The first and most affordable option is to paint or stain the surface. Unfortunately, this application does not provide a significant amount of protection. Stains offer essentially no durability to falls, but they do provide some resistance for spills because they do fill in the pours of the concrete. Paint can provide limited protection, depending on the type of paint being used. An outdoor enamel-based paint does offer a hard top coat that is resilient to some falls and also provides superior spill protection. Mats provide a level of durability and versatility. However, they are not permanent and may not protect against all types of spills, especially those that occur outside of their border. Mats do offer padding and support for work areas, but they may not be suited for automobiles. There are rollout mats that can be removed when not in use, but that adds to labor and necessary storage. Another viable option is click together flooring. While there are vinyl click together tiles used for indoor applications, the tiles referenced here are specific to garages. These tiles are typically vented to allow for spills and are made of hard plastics. They are strong enough to park on and durable enough to handle falls. Additionally, if a tile gets damaged, they are easy to replace. Unfortunately, tiles may be the most expensive option on the list. A compromise when resurfacing garage floor is to choose epoxy. Epoxy coatings offer the strength and durability of tiles but without the significant price tag. The price is somewhere in between paint and tile. Epoxy is like applying a tough rubber or plastic coating onto your entire garage floor. However, while there are DIY kits available, the specifics of this treatment make it more suited toward professional application. There are plenty of options available for resurfacing your concrete garage floor, but which choice is right for you depends on your needs. If you use the garage as secondary storage, then a fresh coat of paint may suffice. However, if your garage is used for a variety of activities, like parking, shop work and storage, then you may be better off with a garage tile or an epoxy coating.